The Lilian's Lovebird (Agapornis lilianae), also known as Nyasa Lovebird, is a small African parrot species of the lovebird genus. The Nyasa species is one of the least studied of all lovebird species. It is mainly green and has orange on its upper chest and head. Although it has been described as common in most of its range, its total population is estimated to number less than 20,000 birds (UNEP-WCMC CITES Trade Database, January 2005). This species is rare in captivity and challenging to breed. The plumage is mostly green. They have distinctive white eyerings and dark red-brown eyes. The beak is red. The forehead and throat is orange/red, mixing into salmon-pink on the crown (top of the head), face and upper breast. The upper tail coverts are green. The tail is green; the lateral feathers are black at the base with a yellow-orange border and banded near the tip. Juveniles are generally duller than adults, with varying black wash on cheeks. The upper mandible (beak) is black at the base. 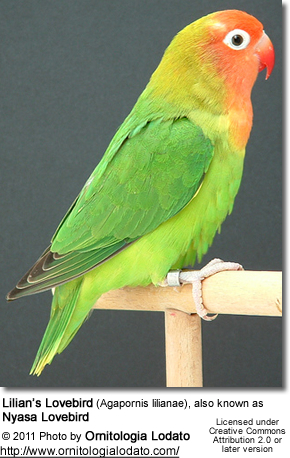 Similar Species: The Lilian's Lovebird is often mistaken for the slightly larger Fischer's Lovebird, which has an olive-green hood and a blue rump. It is also broadly similar to the Peach-faced Lovebird, which has more clearly defined orange coloration, and lacks a white eyering. Lilian's Lovebird is endemic to Malawi, North-western Mozambique, South Tanzania, East Zambia and Zimbabwe. It currently inhabits Liwonde National Park (LNP) and a few cluster groups occur in the surrounding forests outside LNP. Its distribution is rapidly becoming restricted to LNP because their feeding and breeding habitats are being exploited over for agricultural purposes. The extent of habitat loss outside LNP has not been determined scientifically although remaining habitat outside the LNP are fragmented Miombo Forest Reserves. The species is typically found in mopane Colophospermum mopane woodland in the south of its range, but also inhabits belts of Acacia on aluvium and riparian forest. North of its range, they frequent fig trees. This species is listed as Near Threatened because its moderately small population may be in decline. Its number is declining considerably due to flooding of a large section of the Zambezi valley by Lake Kariba, and very likely also by the Cahorra Bassa Dam in Mozambique. Additionally, this species is considered a pest by small-scale farmers. Cases of Lilian's Lovebird poisoning have intensified in recent history and it is not certain whether they fall victim because of their conflict with the farmers or whether poachers are putting out poison to kill larger mammals and these lovebirds fall victims. Liwonde National Park is located in the southern region of Malawi, which has the highest human population density in the country approximating 100-115 inhabitants per km² (FAO, 1997). LNP is greatly impacted by population growth and agricultural activities than any other national park in the country. Generally speaking, its population is in decline due to predation by invasive species and unsustainable levels of exploitation. 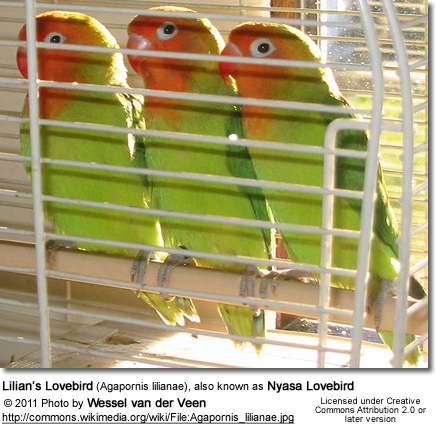 The breeding season for Lilian's Lovebirds is from January to April and in June and July. They make a roofed nest in tree crevices in mopane trees. In captivity the clutch consists of three to eight white eggs, which are incubated for about 22 days, and the chicks leave the nest after about 44 days from hatching. Lilian's Lovebird is a difficult species to rear in captivity. Many breeders worldwide struggle to breed the species. Lilian's Lovebird feeds on grass seeds, including Hyparrhenia, millet, wild rice, flowers, and the seeds and fruit of other species. Their calls are high-pitched. Twittering in flight or when perched.